Take part in activities throughout the day to celebrate the contribution of family firms across Scotland. 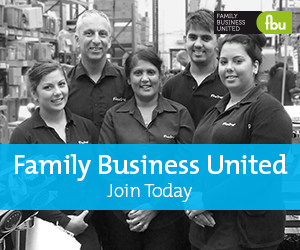 Family Business United founder and champion of the family business sector, Paul Andrews, is delighted to announce Scottish Family Business Day 2019 which is taking place on February 6, 2019. Family firms across Scotland are being asked to join the campaign to celebrate all that is great about the family business sector, something that is at the heart of what Family Business United is all about. A participants marketing and media pack will be prepared and distributed in due course for family businesses and advisory firms who support the family business sector to get involved in the campaign including a press release, banners, twitter schedule and other ways to get involved. Register to receive your pack and updates on how to get involved nearer the time. The first 100 family firms to register will receive the pack free of charge and after that date family firms are requested to support our endeavours to champion the family business sector by making a small donation. For more information about the campaign and how you can get involved in 2019 please do not hesitate to get in touch.